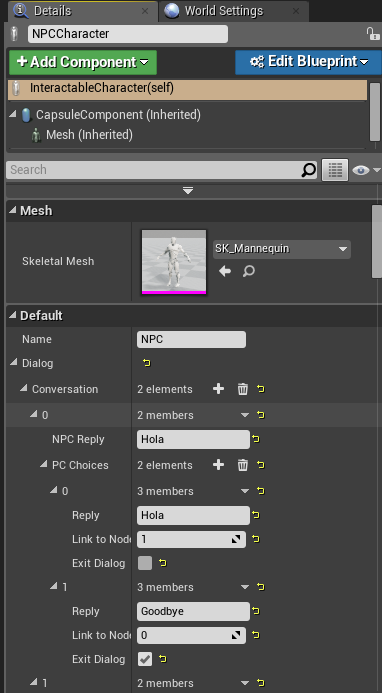 This gives my non-programmer teammates a very easy way to create basic dialog trees with NPCs. However I want to extend this to allow functionality to be hooked into a Blueprint. For example, calling a function to add an item to my inventory or trigger a quest step. Since the dialog tree is split up as multiple Structs, I cannot figure out a clean way to do this. I would like to avoid implementing the full dialog tree in Blueprints, if possible. Ideally, an artist could implement a dialog tree, and pass it on to a programmer to implement the events. this is a very long shot but a dispatcher binding on the playercharacter to a NPC manager who would handle all the npcs (it would bind itself to all the npcs, waiting for they dispatcher call). then the npcs would just do a call with lets say...npcId, dialogId, that could be stored in something like a dictionary, the npc would retrieve that and send another signal, the player would recieve it. sorry if its totally wrong and not the point. 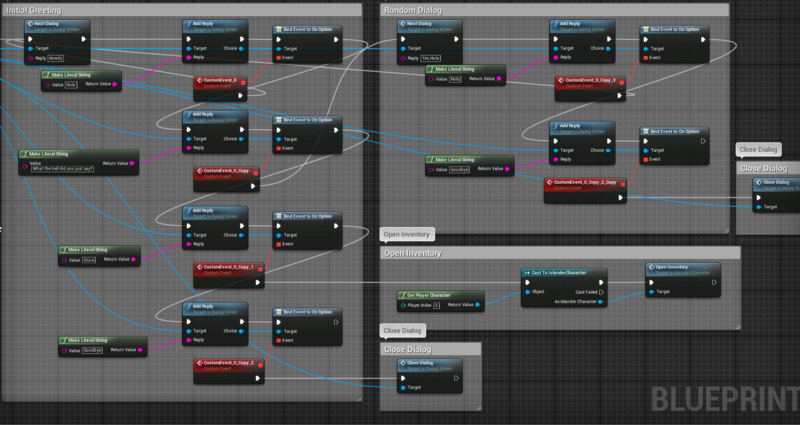 As someone who hasn't yet touched C++ with Unreal, I'm not entirely sure how this fits into what I'm attempting to do. However this is a nightmare for my artist. I'll look into Behavior Trees tomorrow when my brain is properly functioning again. Cheers dude!